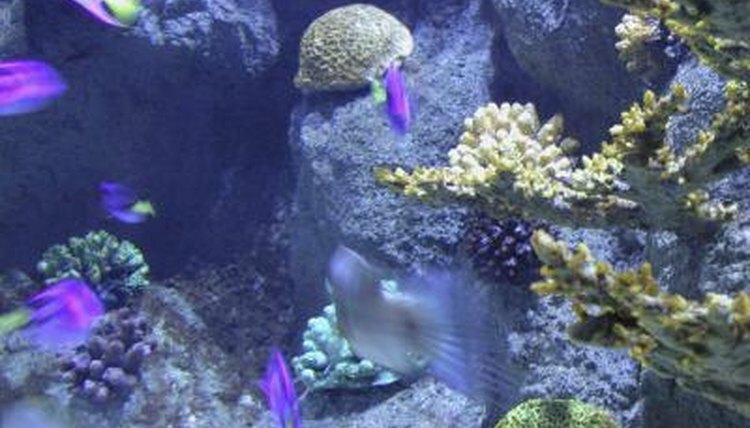 A refugium can play more than a single role in an aquarium, but when the refugium is situated in an aquarium's sump, it is limited to one main role: biological filtration. An in-sump refugium is suited for an aquarium with live macroalgae or plants, which absorb nitrogen compounds and other biological wastes. Refugium equipment has a huge element of customization, and basic guidelines can help you figure out the specifics toward improving water quality. You have to build an in-sump refugium into the sump from the beginning, ideally before you start running the sump. To create such a refugium, select a spot in the middle of the bottom of the sump. With two panes of acrylic or glass -- whichever your sump is made of, since it is hard to glue the two different materials to each other -- section off a rectangular area of the sump. Ideally, a refugium should take up 10 percent of the space of the sump. Plan around baffles or equipment you intend to install in the sump. Then, affix your baffles in place. Make sure you use the correct adhesive, since glass and acrylic require different bonding agents. Since an in-sump refugium works well only for macroalgae -- or plants, if you have a rare freshwater sump -- you need to take extra care in selecting which organisms to harbor. Generally, you want fast-growing macroalgae, since they will absorb nitrogen compounds while they grow. Many species in the Caulerpa and Chaeto genera of macroalgae serve this purpose well. Keep in mind that macroalgae need powerful lighting. One major design decision for sumps in general and for refugiums in particular is hidden or open, which directly affects your lighting choices. One of the perks of having a sump is that you can hide unsightly equipment under the aquarium. However, some hobbyists like to display their sumps openly. In addition to allowing you to show off expensive or inventive aquarium equipment, such a setup gives you more choices for lighting. Macroalgae need powerful lighting to thrive. In a displayed sump, you can use fluorescents or metal halide lights. However, if the sump is hidden away, such lights can overheat in a closed aquarium stand. In such a case, LED lighting makes a better choice since it does not heat up as much. In any case, a lighting schedule of eight to 10 hours daily works well for macroalgae. An in-sump refugium does not need much in the way of special care beyond regular aquarium chores like water changes. The main exception is pruning. You will need to cut back your macroalge periodically, which will help to remove nitrogen compounds from the aquarium. Unfortunately, fast-growing macroalgae like Caulerpa can rapidly choke out native species if they get released outside of their original range. Always freeze Caulpera and other algae clippings for at least 24 hours before throwing them out to prevent the plants from wreaking environmental havoc locally. FishChannel.com: Is an Aquarium Sump Necessary? Should I Put Snails in My Saltwater Refugium?